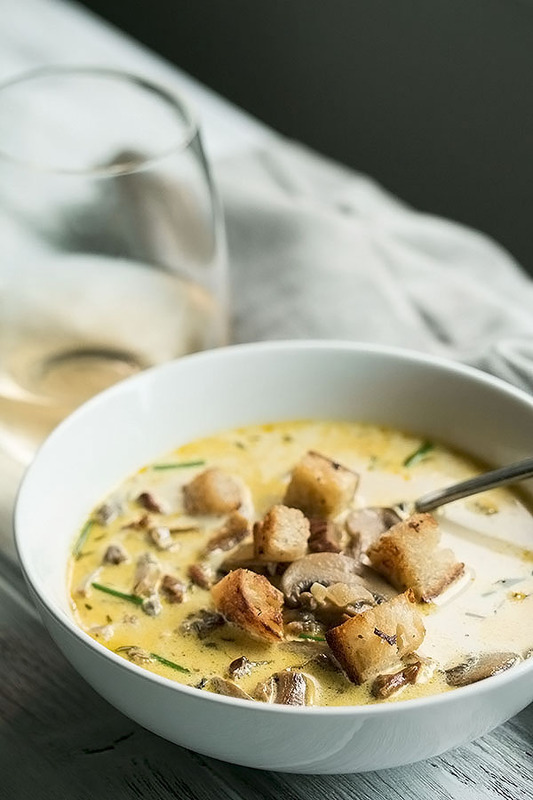 Homemade mushroom soup made with buttery fresh and dried mushrooms, caramelized onions, smoky bacon, a touch of cream and loads of flavor! Made even better by easy pan fried sourdough croutons with garlic butter and truffle oil! Never ever will you ever open up another can of mushroom soup! Bold statement you say? Well make this soup and then you be the judge. Mark my words though, canned soup will be out, homemade mushroom soup will be in. It truly is the best mushroom soup there is. A couple of years ago I had my eyes opened to the wonders of homemade mushroom soup when I ordered the mushroom soup at Earl’s restaurant. I do realize that soup at a restaurant isn’t homemade per say, but it certainly wasn’t out of a can. It had big chunks of mushrooms, herbs and real cream. It was outstanding! From the very first bite I knew I would be making my mushroom soup from scratch from then on. 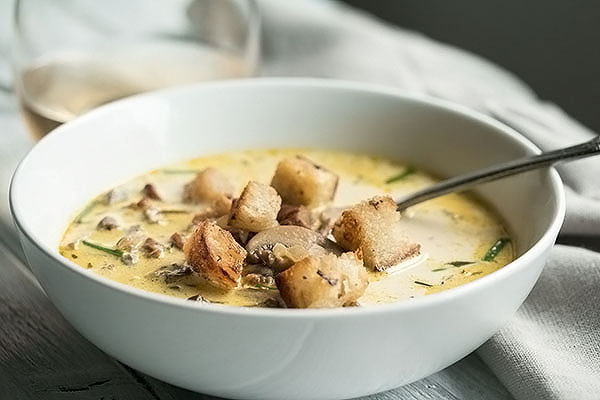 This mushroom soup recipe has both fresh mushrooms and dried mushrooms. 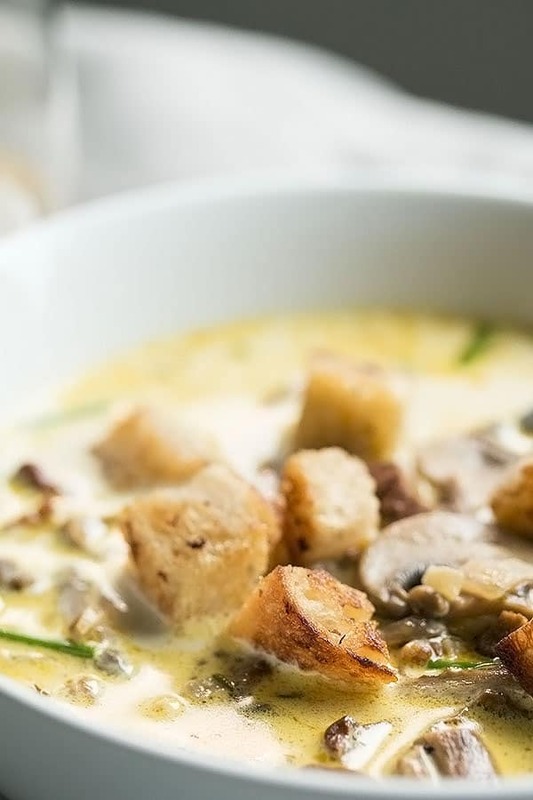 The variety gives a complexity of flavor to the mushroom soup. We used dried porcini and lobster mushrooms, but you can use the ones you like. We looked far and wide for chanterelles, but no deal. If you can find them dried or fresh, use em! We used crimini mushrooms as the fresh mushrooms in this recipe, but you can use white, button, portobello or whatever you like. As I mentioned, a variety will give you the best mushroom soup! 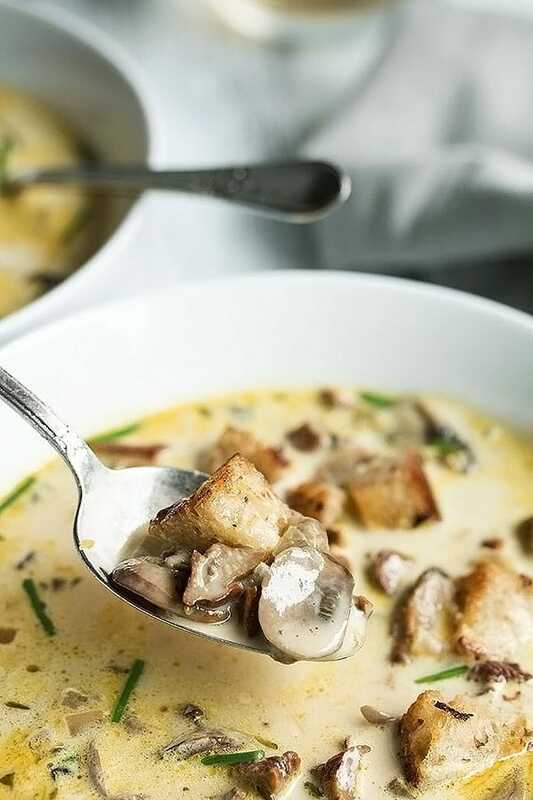 Homemade mushroom soup is the perfect show off dish if you have friends that love mushrooms. 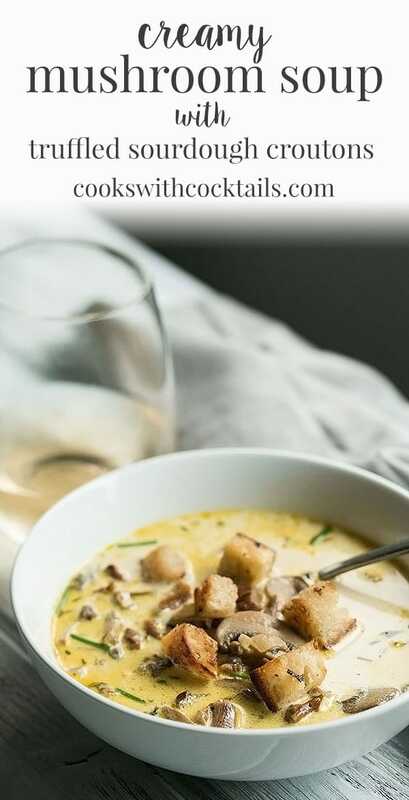 Make this for guests and not only will you delight their taste buds, you will forever be known as the friend who ruined canned mushroom soup for them forever lol! We have to talk about the homemade croutons for a moment. They are crispy, buttery, garlicy, salty and truffly and they crunch first and then melt in your mouth. DIVINE! And honestly so dang easy to make. You better make extra cuz you will be popping these babies in your mouth as you wait for your soup to finish cooking. Once you eat one, your done… I’m seriously starting to drool just thinking about them. One word of caution, add the cream a bit at a time. Start with 1/4 cup and then do a 1/4 cup each time you add more. 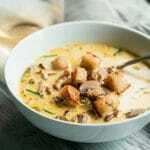 Some people like more creamy soup than others and the mushroom soup can taste quite rich with the full cup of heavy cream so its best to start off slow. If you are just serving it as an appetizer, then its not such a big deal, but for a big bowl, you might find it too much. 10 Quart Stock Pot – we love this stockpot. 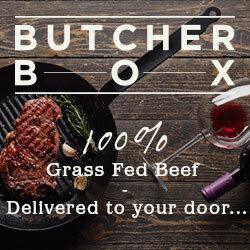 Its pretty, great quality and big enough for making bone broth, chili, or any soup. Heat Resistant Oven Mitts – Debbie has a pair of these and I need to get some. They are so awesome and with the fingers all separated, you can even use them to turn skewers on the grill. Super handy! Ceramic Soup Bowls – these are the cutest! So are these ones! Add the dried mushrooms to a bowl and cover with warm water. Set aside to re-hydrate. Heat a skillet on medium heat. Chop up your bacon and add it to the pan. Cook until the fat is rendered and the bacon starts to crisp up. Remove some of the fat if you have a lot. Leave about 2 tbsp in the skillet. While the bacon is cooking, also make your croutons. Heat a pan on medium-low heat. Add the butter, olive oil and garlic then sauté till the butter is melted. Add truffle oil and salt and mix together. Add the bread cubes and stir till they soak up all the butter. Cook till nicely browned. Cool completely and they will become crunchy. Add the butter, shallots, garlic, thyme, sliced crimini mushrooms, and re-hydrated dried mushrooms to the skillet. Add the salt and pepper. Cook for a few mins or until the mushrooms start to brown. Add the wine and stir, scraping up any bits of anything that's stuck to the bottom of the pan. Then add the broth and mushroom water. Cook for a few mins and then add the cream. Stir well and check the seasoning. Add some salt and pepper if you need some. Throw in the chopped chives and serve with the crunchy croutons. This looks really good. I have made my own mushroom cream soup in the past and was not been disappointed, but this looks better. I think the keys are more butter, more cream, and a bunch of bacon probably doesn’t hurt. Thanks Ben 🙂 I agree, bacon never hurts lol.